Taking on the business of medicine. Dr. Talal Ghazal was already an accomplished medical professional when he decided to pursue his Healthcare Master of Business Administration from the George Washington University. 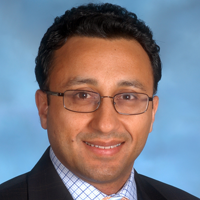 When Dr. Ghazal enrolled to earn his Healthcare MBA online, he had already served as director of pain clinics at three INOVA hospitals in northern Virginia, as co-director of pain services at Holy Cross Hospital, secretary and treasurer of the Department of Anesthesiology at Holy Cross Hospital, and clinical associate professor of allied health professions at a nearby university. Discovering the language of business. Dr. Ghazal didn’t have to go to business school; his career was going very well without it. But at multiple times in his career, he stood in front of stakeholders and executives to pitch new ideas or present data, and left feeling disconnected from them. The meetings always went well, but without deep knowledge of the finer points of business and finance, Dr. Ghazal always felt like there were roadblocks preventing proper communication. His Healthcare MBA coursework at GW helped him identify where things were veering off course: Although he had intelligently and enthusiastically presented his ideas, Dr. Ghazal was unable to communicate his thoughts about finance and implementation effectively. After pinpointing an area for improvement, Dr. Ghazal worked to bridge the communication gap between himself and high-level decision-makers. He began to frame each lesson as an opportunity to develop, practice and perfect his understanding and articulation of important business practices. One example Dr. Ghazal recalled from his online MBA coursework that really served as an aha moment was a consulting assignment at the MRI Scanning Department of a local hospital. Dr. Ghazal and his classmates were tasked with improving several processes including scheduling, wait times and cancellations. As a business student working with medical professionals, he witnessed the cognitive disconnect that exists between medicine and business. Dr. Ghazal and the consulting team were able to identify several deficiencies immediately that the staff had not noticed. This was one of the pivotal moments during which Dr. Ghazal realized how valuable his MBA education was and how it would help him attack business issues with a new perspective. Still in love with the practice of medicine, Dr. Ghazal wasn’t ready to hang up his white coat for a blazer. But he did want to incorporate the newfound knowledge and insights from his business education into his practice. Admitting that shortcomings can exist in the business management of day-to-day operations, or that a better mode of operations may be possible, is only the first step. The more challenging aspects can be determining a solution, convincing leadership that the changes are necessary, and implementing those solutions in a busy working environment.